Product Name:FILORGA M-HA 10® (3x3ml). Active composition: Pure Hyaluronic Acid (10mg/ml). Volume and packaging: 3x3ml pre-filled syringes. Accessory: Contains treatment needles, package insert. Storage Conditions: Store between 2℃ and 25℃. Fragile. FILORGA M-HA 10® (3x3ml) is a sterile, colourless, clear, transparent, isotonic, viscoelastic, biodegradable and injectable gel. FILORGA M-HA 10® (3x3ml) is composed of sodium hyaluronate which is non-animal, obtained from biofermentation. FILORGA M-HA 10® (3x3ml) is intended for use in mesotherapy treatments, replenishing hyaluronic acid that has been lost through ageing. Inject FILORGA M-HA 10® (3x3ml) into the dermis to improve skin tone and elasticity and to act as a filler for superficial lines such as crow's feet around the eyes, smile lines called nasolabial folds, or smoker's lines around the mouth, and it can be used in combination with other FILORGA products. Since precision is essential for a successful treatment, FILORGA M-HA 10® (3x3ml) must be used by medical practitioners who have undertaken specific training in injection techniques for filling. Why should I purchase FILORGA M-HA 10®? 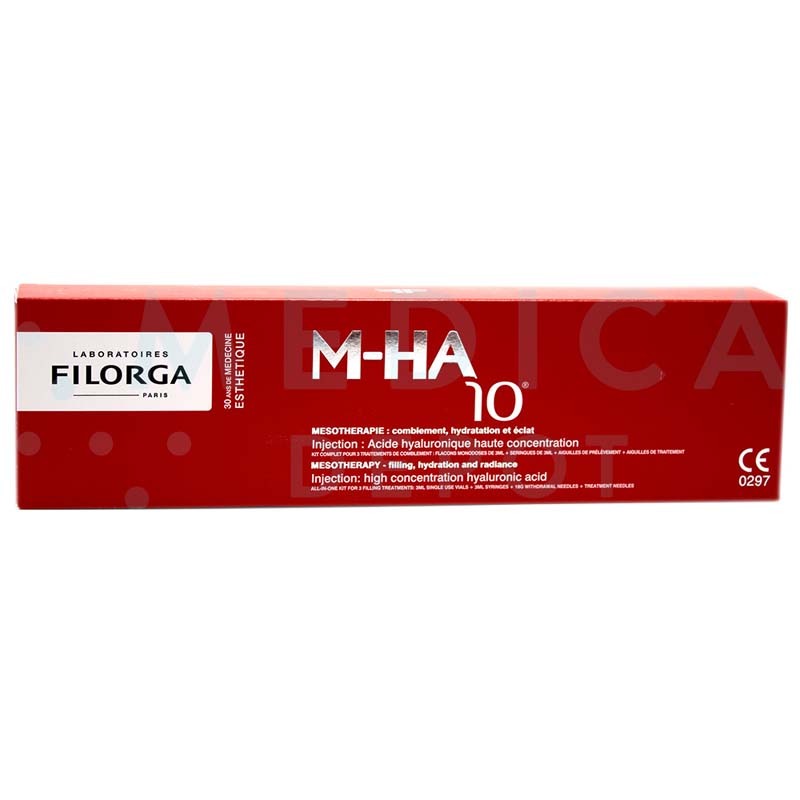 FILORGA M-HA 10® can help rehydrate skin and reduce the look of fine lines and wrinkles, and you can order wholesale FILORGA M-HA 10® online at MedicaDepot.com. When you purchase FILORGA M-HA 10® from Medica Depot, you can restore hydration to your patient's skin from within for a softer, smoother, brighter, and more youthful-looking complexion. Who can benefit from FILORGA M-HA 10® mesotherapy treatments? Mesotherapy treatments are a series of small injections of hyaluronic acid that can help rehydrate the skin. A wide range of patients can benefit from FILORGA M-HA 10® mesotherapy injections to improve their skin. Whether they are younger or older, your patients can experience dry skin, especially in dry winter weather or when exposed to too much sun. FILORGA M-HA 10® (3x3ml) can help rehydrate their skin from within, and can be used on their face, neck, decolletage, and backs of their hands. How does FILORGA M-HA 10® work to improve the skin? FILORGA M-HA 10® (3x3ml) is made of pure hyaluronic acid, a substance that is found naturally in skin tissues and throughout the body. As patients age or experience damage from sun exposure or winter weather, their skin can begin to lose hyaluronic acid and dry out. When you inject FILORGA M-HA 10® into your patient's dermis, the hyaluronic acid gel binds moisture to hold it at the skin's surface. Once moisture is restored to the skin, signs of dryness are reduced and the extra volume helps to fill small lines and wrinkles. Hyaluronic acid can also help stimulate the production of collagen and elastin over time, helping to restore strength and elasticity to the skin, and act as an antioxidant to protect skin from free radical damage. While skin creams may moisturize the surface of the skin, FILORGA M-HA 10® can rehydrate skin from within for a softer and smoother texture along with a brighter glow. When should my patients set their FILORGA M-HA 10® treatment schedule? When skin starts to become dry and show the first signs of aging, even your younger patients can benefit from FILORGA M-HA 10® mesotherapy treatments. You should start by giving your patient a set of FILORGA M-HA 10® injections once a month for three months to get the maximum effect. After this, your patient should return for a maintenance treatment every six months to keep their skin looking and feeling hydrated and smooth. What are the most common FILORGA M-HA 10® side effects? Although the pure hyaluronic acid in FILORGA M-HA 10® is similar to what is naturally found in the body, patients could experience some injection-related reactions. These FILORGA M-HA 10® side effects could include inflammation, including swelling, redness, and rash, as well as itchiness and pain at the injection site when it is pressed, lasting up to about a week. Other FILORGA M-HA 10® side effects could include discoloration, induration or nodules, granulomas, abscesses, hypersensitivity, or necrosis when injected into the glabellar region. Where can I purchase wholesale FILORGA M-HA 10® for my aesthetic clinic? If you are a licensed plastic surgeon, cosmetic specialist, other type of doctor or medical practitioner, hospital, or clinic, you can buy wholesale FILORGA M-HA 10® from MedicaDepot.com. Adding FILORGA M-HA 10® (3x3ml) to your clinic's aesthetic treatments can help a wider range of patients achieve improved skin, even if they do not yet have more obvious signs of aging. Order FILORGA M-HA 10® online from Medica Depot to help your patients regain the softer, smoother, brighter skin of their youth. Information about this product that is provided by Medicadepot.com is only summary, and does not cover all of the information about this product. 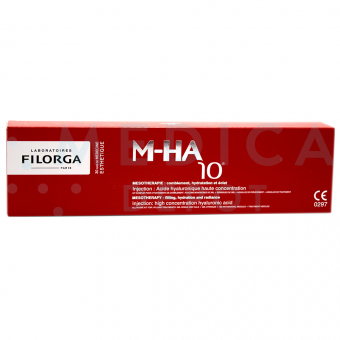 * Medica Depot offers only genuine FILORGA M-HA 10® (3x3ml) that is manufactured by Filorga. All brands listed here including FILORGA M-HA 10® (3x3ml) are the trademarks of their respective owners. Medica Depot is not operated by, supported by or affiliated with Filorga.